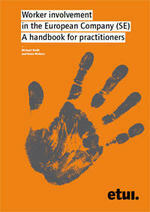 The handbook introduces the SE and its mechanism of employee involvement. It explains the negotiation procedures and provides ‘tips and tricks’ for a decent preparation of negotiations. Based on the experience of several experts, it gives an overview of key aspects of an SE agreement and includes an extensive set of overviews, graphics and comparative tables. In October 2001, the EU formally adopted the legislation on the European Company, also known by its Latin name Societas Europaea (SE). This handbook aims to ensure that the new opportunities for employee representation at European level which these new SE rules provide, are seized. It has been designed first and foremost to help practitioners to prepare and conduct negotiations on agreements on employee involvement in SEs.